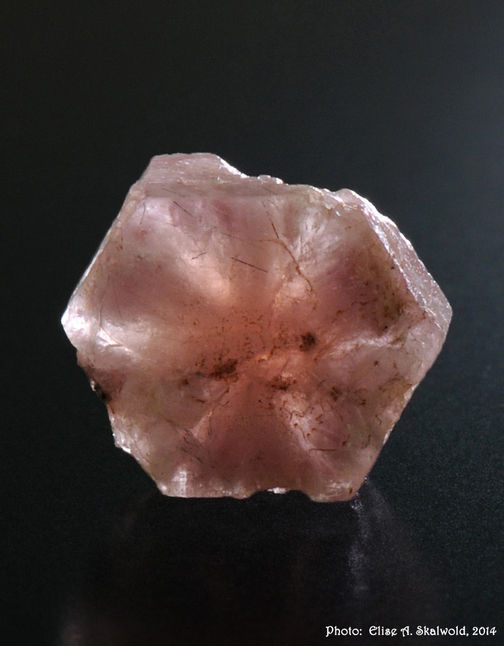 Pezzottaite: Mineral information, data and localities. Named by Brendan M. Laurs, et al. in 2003 in honor of Federico Pezzotta (28 October 1965, Bergamo, Italy - ), petrologist and curator at the Museo Civico, Milano, Italy, for his work on Madagascar's granitic pegmatites. Related to beryl. 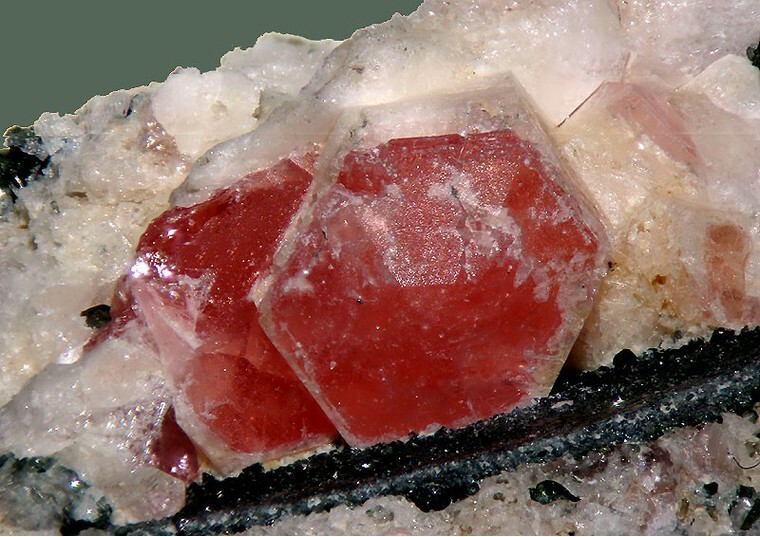 Pezzottaite is trigonal while beryl is hexagonal. Visit gemdat.org for gemological information about Pezzottaite. Hexagonal tabular crystals, small flat to equant crystals. Schorl 15 photos of Pezzottaite associated with Schorl on mindat.org. Albite 14 photos of Pezzottaite associated with Albite on mindat.org. Tourmaline 5 photos of Pezzottaite associated with Tourmaline on mindat.org. Chiavennite 2 photos of Pezzottaite associated with Chiavennite on mindat.org. Lepidolite 1 photo of Pezzottaite associated with Lepidolite on mindat.org. Laurs, B.M., Simmons, W.B., Rossman, G.R., Quinn, E.P., McClure, S.F., Peretti, A., Armbruster, T., Hawthorne, F.C., Falster, A.U., Günther, D., Cooper, M.A., Grobéty, B. (2003) Pezzottaite from Ambatovita, Madagascar: A New Gem Mineral. Gems & Gemology: 39(4): 284-301. Hawthorne, F.C., Cooper, M.A., Simmons, W.B., Falster, A.U., Laurs, B.M., Armbruster, T., Rossman, G.R., Peretti, A., Günter, D., Grobéty, B. (2004) Pezzottaite Cs(Be2Li)Al2Si6O18 A spectacular new beryl-group mineral from the Sakavalana pegmatite, Fianarantsoa province, Madagascar. Mineralogical Record: 35(5): 369-378. Beryl and its Color Varieties (2005) Extra Lapis English No. 7. Pezzotta, F., Guastoni, A., Forner, H., Demartin, F., Kristiansen, R. (2005) Découverte exceptionnelle de chiavennite associée à pezzottaite dans la pegmatite de Sakavalana, Mandrosonoro, Madagascar. Le Règne Minéral: 61: ???-???. Piilonen, P.C., Grew, E.S., Ercit, T.S. (2005) New mineral names. American Mineralogist: 90: 1227-1233. Devouard, B., Devidal, J.L. (2007) Pezzottaite from Myanmar. Gems & Gemology: Gem News International: 43(1): 70-72. Yakubovich, O.V., Pekov, I.V., Steele, I.M., Massa, W., Chukanov, N.V. (2009) Alkali metals in beryl and their role in the formation of derivative structural motifs: comparative crystal chemistry of vorobyevite and pezzottaite. Crystallography Reports: 54: 399-412. Gatta, G.D., Adamo, I., Meven, M., Lambruschi, E. (2012) A single-crystal neutron and X-ray diffraction study of pezzottaite, Cs(Be2Li)Al2Si6O18. Physics and Chemistry of Minerals: 39: 829-840. The following Pezzottaite specimens are currently listed for sale on minfind.com. Laurs, B. L. et al. (2003): Pezzottaite from Ambatovita, Madagaascar: A new Gem mineral. Gems & Gemology 39 (4): 284-301; Hawthorne, F.C., Cooper, M.A., Simmons, W.B., Falster, A.U., Laurs, B.M., Armbruster, T., Rossman, G.R., Peretti, A., Günter, D., and Grobéty, B. (2004) Pezzottaite Cs(Be2Li)Al2Si6O18 A spectacular new beryl-group mineral from the Sakavalana pegmatite, Fianarantsoa province, Madagascar. Mineralogical Record: 35(5): 369-378; G. Diego Gatta, Ilaria Adamo, Martin Meven, Erica Lambruschi (2012): A single-crystal neutron and X-ray diffraction study of pezzottaite, Cs(Be2Li)Al2Si6O18. Physics and Chemistry of Minerals 39, 829-840. 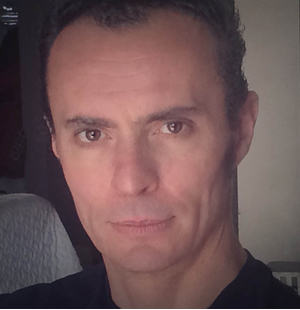 Devouard, B. and Devidal, J.L. 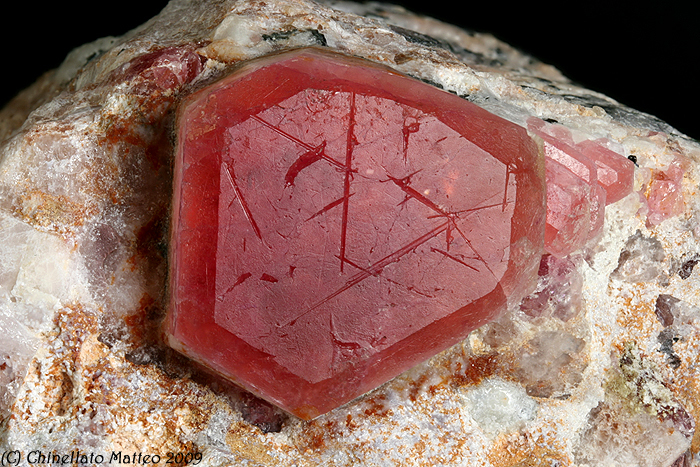 (2007): Pezzottaite from Myanmar. Gems & Gemology: Gem News International, 43(1), 70-72. A. Pieczka et al. (2016) Cs-bearing beryl evolving to pezzottaite from the Julianna pegmatitic system, SW Poland. Can Min 54: 115.